I love the idea of cream blush, but in reality none seem to work for me. They've always either appeared patchy or ran down my face before I could step outside the door. One that I somewhat liked was Something Special from MAC (reviewed HERE), but the problem with this one is that it feels too heavy and sticky on my cheeks so I hardly wear it. But never mind, like a true beauty junkie I had to give cream blushes one more go before I completely banned them from my make up case. 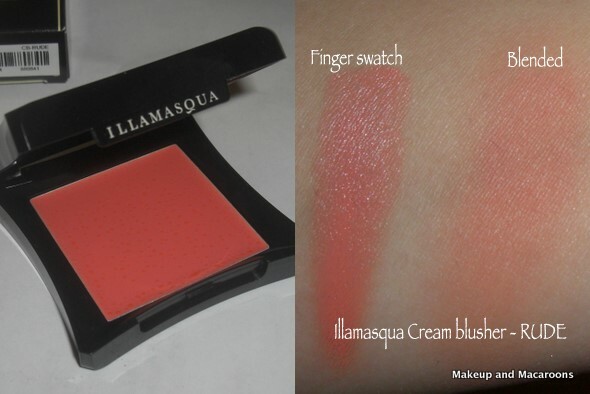 Egged on by some of my blogger friends on Twitter, I decided to buy Rude from Illamasqua, a beautiful warm coral shade. Illamasqua is one of my favourites brands, if not THE MOST favourite makeup brand of all, so I don't know why I didn't buy it sooner! lasts about 4-6 hours on my dry skin before fading away. Unlike other cream blushes I've tried, this doesn't go patchy as it fades, instead the colour just seems to lighten and then fade away to nothing. can be worn under or over powder. Normally with cream blushes you have to put this on over your foundation, as putting it over powdered skin will make it go patchy. However with this one I normally use it after I've powdered my face and had no problems blending. can be worn on the lips, but you'll need some balm on first as it can be drying. 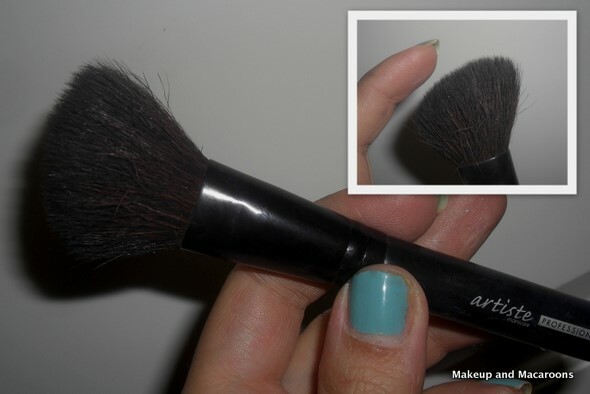 I use my Artiste by Manicare angled blush brush ($14.95 from Priceline and Myer) to apply this cream. I use the flat top bit, and use a patting motion rather than swiping like I would a powder blush. Because of the fact it's not very long lasting, I would not wear this at work because I need something that will last me a full work day. However this is perfect for weekends when I have more time to freshen up. Here's what it looks like on my face, with and without flash. Will I purchase again? Absolutely! Do you like using cream blushes? Oooh, Rude is on my wishlist, and this post makes me want it even more! It's just so pretty. You won't be disappointed, it's gorgeous! That is a gorgeous shade Lilit. It's not too orange which hopefully means it will suit my skin. :) On my wishlist too! It's definitely not too orange, in the pan it's quite dark but for my NC25 skintone it's just the right amount of brightness. It looks like a beautiful colour. I only have one cream blush as I prefer powders, its just easier to get an even colour with I find but I would still love to try this one. I still prefer powders as well, easier to work with! But this one is great for lazy days when I want more of a sheen to my skin. Yep it's easy to go overboard with this one! First time I wore it I had to powder it down as I was too heavy handed with it, but now I've got it right finally! So glad you got this, I knew it would look amazing on you! Thanks Megan, you convinced me to get it and I'm not disappointed! Argh I want this shade but I barely touch Libido as it is :( I feel you on the melty cream blush though, I love it during the cooler months but can't venture anywhere near it during Summer. Silly sweaty face and Aussie humidity! The weather in Syd is so bad this summer that I can actually wear it now without the sweaty face happening. But yeah I can't wait till cooler months as I'll def be able to wear this more often without worrying it melting off after 4 hours. Ahhh I SO want this!!!! Still first on my wish list and I always get something else. I actually prefer cream blushes as I have dry skin on my cheeks. I like layering a powder blush on top for work so that it lasts all day. Your next one should be Betray! Just reviewed those a week or so ago! It's so pretty! I was going to purchase this in a blog sale, but passed it up. Darn! I like blendable cream blushes, because my skin is quite dry and some days I just don't feel like powder. Rude is a very wearble shade but I agree with you about the wear time. :D You make everything look so pretty though!